This patient of Dr. Johnsons’s wanted the spaces closed between teeth but preferred to not go through braces. 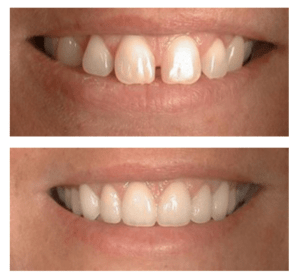 This dramatically improved her smile and was completed in only a few weeks. If your smile is crooked or uneven, Instant Orthodontics can give you the straight, perfect smile you have always wanted. Instant Orthodontics usually takes only 2 to 3 visits to our dentistry office, and you don’t need to wear metal braces. Instant Orthodontics utilizes dental veneers. These thin shells of porcelain can work wonders on your crooked, uneven teeth. Porcelain veneers can be used to alter the width, spacing, and shape of your teeth, as well as repairing unsightly chips and cracks. If you live in Park City, Duchesne, Vernal, or Salt Lake City area, in Utah, or like many of our patients are willing to travel for the highest quality and care, please contact our office.